Today the Li-Ion batteries seem to have reached their full potential and the only improvement lately is the fast charging technologies provided by companies like Oppo and Qualcomm. The lithium batteries aren’t getting any thinner, smaller and their capacity increases at very modest rates. We need something better and the aluminum battery at Stanford might be just the discovery we need today. The team behind the new type of battery says their biggest challenge, as to all others before them, was to find a material, which will be capable of providing enough voltage over many cycles of charging/discharging. And they’ve found one by accident – graphite – the battery’s anode is aluminum, while its cathode is graphite. The Aluminum Ion they’ve created can use various pouches for the liquid ion electrolyte, which means it can be much thinner and flexible than today’s mass market offers. Also, it won’t explode or catch fire as do the Li-Ion batteries when put to extreme conditions. You can even drill a hole into the Al-Ion battery and it will continue to work for a while before it dies, and yet there will be no fire. Finally, the Stanford battery can go up to 7,500 cycles before it starts loosing capacity, which is 7.5x better than the current Li-Ion units with 1,000 cycles lifetime. And the best part is the battery can be recharged lightning fast – the Stanford prototype charges in just a minute! Is it cheap? Very. 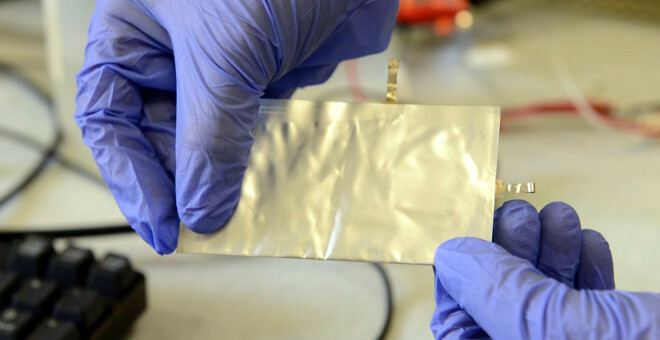 All materials used to make such aluminum ion battery cost just few dollars for a kilo. The first prototype of the Al-Ion battery, as we said charges in a minute, and its maximum output is about 2V. This makes it twice less powerful than Li-Ion batteries in our smartphones, but hopefully they will be able to improve this in time.